I'm new to revive-adserver, but I'm excited about it, I did a successful installation on my local machine, v4.1.3, tested with multi sites at localhost, everything working fine, i like it a lot! Then when I went to upload on the live server, (it runs php 5.6, and I'm using HTTPS), installation in a subfolder was ok (https://mydomain.com/reviveadserver/), plugins were installed and enable. I can create advertisers, campaigns, websites and banners ... but I am not able to have the "invocation code" display: when I click the "invocation code" tab, it shows a blank tab, and the browser reports a 500 error (500 Internal Server Error). There is nothing on the logs and my host support says that it's nothing on their side. Pop-ups are allowed on my browser, and I can see the banner preview ok when editing the banner. I did a google search, read various topics on this forum but after a entire day I'm exhausted. Does anyone had a similar issue in recent times? Any comment will be very welcome guys, thank you a lot! Alas, a 500 internal server error means exactly that - something went wrong internally with the server. That could be a web server problem, or it could be that there was a fatal PHP error. Either way, the logs on the server (both webserver and PHP logs) are where you need to look. If there's nothing there, you may need to increase the logging level. Line 58 I put here below with underline. Is "$zoneid" being a boolean for some reason? What could be causing that? Unfortunately I don't see where to go from here. I'd maybe double check all the plugins really are installed and enabled? Yes the plugin part seems ok. But I did the double check just to make sure (uninstall/reinstall all / enable), no changes, same behavior. I face a similar issue, see below my pc localhost installation (working fine) vs the webhost server installation (error). 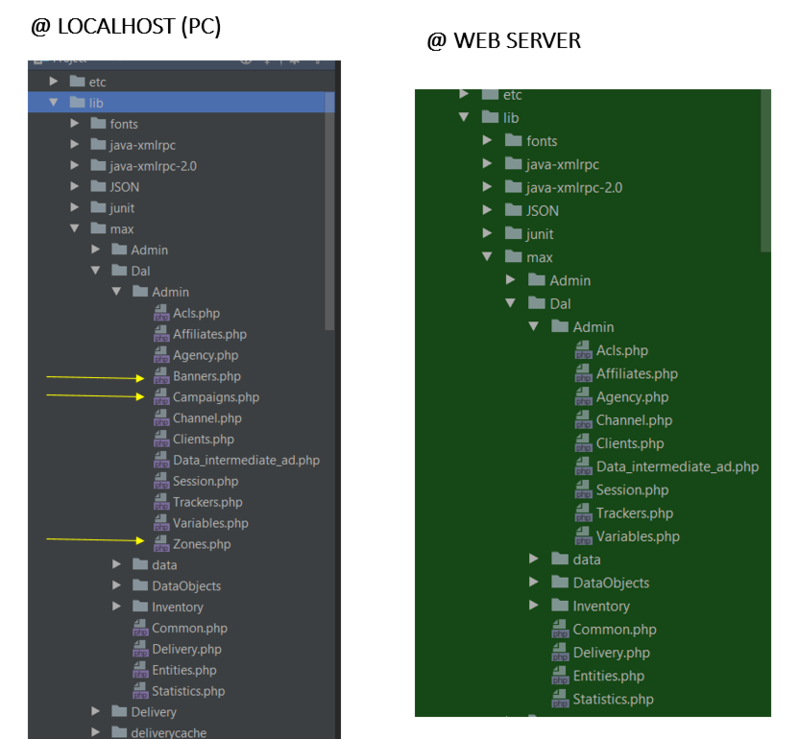 "Banners.php", "Campaigns.php", "Zones.php" are not present on the web server installation. (at folder /lib/max/dal/admin/). Also it's like they are not allowed on the server, any folder where I try to upload them, they are gone in seconds. Good news, I believe I was able to overcome this issue. First let's say my host company didn't help at all, unfortunately I'm alone on this. Everything seems to be working fine until now, I tested with an external call to banner and it shows ok. I'll post any updates here. Thank God I make it work, I was almost giving up for a plan B. But now my question, are those lines/functions essential for the software? Do I have to keep something in mind because of doing that? Thanks you guys for this very helpful forum here. As a general rule, I would say yes, most of the code is required. If you go changing things, then who know what will work or won't work. I hate giving this advice, because it always seems a little lame and unhelpful, but honestly, if your hosting provider cannot give you a host where you can upload files and they files you put in place actually stay there, then you're wasting your money. There are plenty of other hosting companies out there who actually deliver the service that you pay for. "This would appear to be an issue with the content you are adding. If the content is corrupt, it could be rejected by the server however, we do not have way to provide guidance on whether code or function is not able to be uploaded. You would want to consult a web developer for further assistance with getting your site code to function on our hosting server." Well, luckily the adserver is delivering ok, geotargeting ok. I'll probably try to dig deeper into this issue as soon as I have more time, but for now I'll leave as it is. My demands are small scale so I'm not risking too much trouble for now. The Revive is great, I'm enjoying working with it, it's simple and direct, very intuitive. Hopefully as I grow into this world of digital advertisement (I'm new to advertisement in general) I'll come back here to learn and share more with the community.